Pat Anderson, The Man Behind The Omni’s Incredible Recent Visual Tributes, Reveals His Process. The Omni Hotel has been a cornerstone of the Dallas skyline since it opened in 2010. But, thanks to some recent creative uses of exterior lighting, the hotel is really shining of late, as its facade has been used to celebrate progress, memorialize icons and honor victims. These simple but impressive designs for the hotel’s LED facade have elicited cheers from locals and people across the globe alike. And, the case could be made, they serve as the best PR campaign that Dallas has, with these visual messages on the technicolor hotel going a long way toward helping this city shed its longstanding reputation as the City of Hate. See Also: Light It Up. // Screw It. Let’s Just Affix LED Systems To Every Downtown Building. Behind it all is Pat Anderson, the man tasked with handling, selecting, designing, uploading and maintaining these visuals. 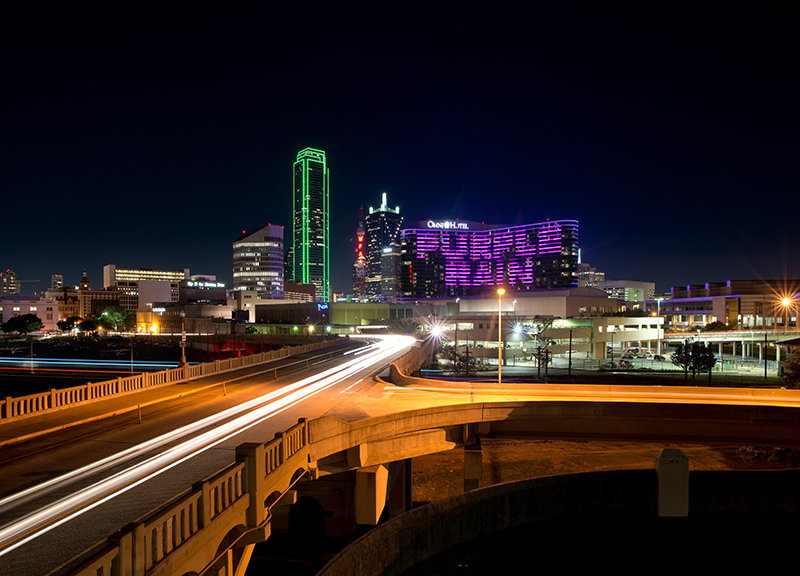 Here, Anderson gives us some insight into his processes as the man responsible for providing the Dallas skyline with its most explicit message on any given night. Can you describe the process of adding new art to the exterior of the hotel? Is it as simple as uploading an image? Is there lots of coding involved? Images can be uploaded if formatted correctly. The lighting system doesn’t really understand that the “screen” wraps around the building, so it will automatically try to center the image. So an image must be uploaded that is, very simply put, doubled. There needs to be a left and right image — the left being the front of the building and the right being the back side of the building. There’s no coding involved. The system itself was made for show-production use. The same type of system might be used for a Broadway production or a concert venue. This is a very similar system to what is used for all the LED lights and video screens you might see there. Only, in this case, the output is very different and very low-resolution. How do you decide to do a tribute? Specifically, you made headlines when you paid tribute to the victims in Pakistan when no one else was. How do you decide what makes the cut? I try to run tributes for large tragedies. I don’t really have a predetermined way of determining if the event qualifies or not. I just judge by the effect that it has on people, the media and/or social media. If it gets enough attention, I try to do something special to make those victims and/or their loved ones feel a little better. I would hope that they might feel a little better knowing that the people in Dallas are thinking of them during that particular tragedy. After the terrorist attack in Pakistan, I discovered that that particular terrorist attack was apparently targeting children. That night, I ran the Pakistan flag. There were a few negative comments from certain individuals that didn’t think we should show any support, claiming that Pakistan is “a terrorist state” and other such comments — but what really got me was that this was an attack on small children. During the next few days, more positive comments were received. I was even sent a link to an online news media website in Pakistan that displayed a picture of the Omni on its home page that day. Can anyone advertise on the Omni, or do you decide everything that goes up? Do you coordinate with any other sites like Reunion Tower? The city ordinance that allows the lights to run does not allow for advertisement of events outside a specific area, plus the advertisement must be for an event. We cannot run the logo of a soft drink manufacturer just because they paid for it. But if that same manufacturer has their annual convention at the Omni, we sure can. We sometimes coordinate [with Reunion Tower, Bank of America Plaza and other Downtown Dallas buildings], but not very often. A few years ago, Dallas Video Fest began showing short films on the Omni. Are there plans for that this year? That event, which is part of the annual Dallas Video Fest, is called Expanded Cinema. That same event has happened every year for the past four years. This late summer, we will probably be running the 5th Annual Expanded Cinema, but we haven’t begun to work on that project just yet. How far in advance do you program the lighting? Is there a set schedule? I can pre-schedule the lights in the system up to a week in advance. The system runs on a seven-day cycle. But that doesn’t mean that there aren’t already events planned much further out than that. I’ve gotten a year’s advanced notice several times. It’s pretty. It’s so pretty! Is there anything you wouldn’t put up? I don’t do wedding proposals, birthday wishes, anniversaries or anything like that. I also would not do anything vulgar, religious, racist, sexist, political, etc. The Omni Hotel is a primary part of the beautiful skyline of Dallas. I love Dallas. I’m from here. I wouldn’t do anything to disrespect Big D. I try to keep things upbeat. If I can put a smile on someone’s face as they drive down I-30, I’m happy. And I’m always keeping an eye out on social media for photos that are hashtagged #omnidallas. Cover photo by Justin Terveen.